Is there a way to knife someone in BF4 without the animation? In Battlefield: Hardline, if you are prone and knife someone, it will kill them without doing an animation. Is there a similar feature in Battlefield 4? So far I’ve tested a couple different ways of doing it (a bunch of angles standing up and laying down) but it hasn’t worked. 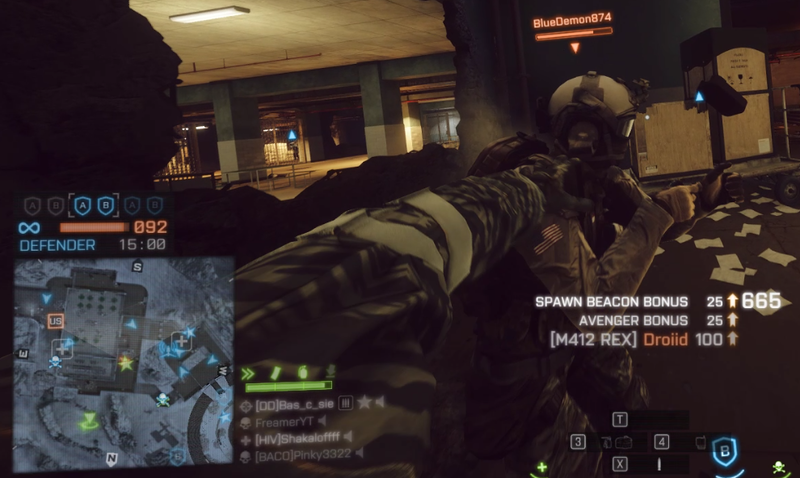 The knifing mechanic in Battlefield 4 is really basic. If you are close to an enemy and you hit the knife button, you always start the animation. You then loose all control over your player till the animation is finished. Knifing players in vehicles isn't possible, knifing a players occupying a stationary MG works the same as regular knifing. If you want more information, I've written out the complete knifing mechanic below. A player that is in close proximity to an enemy presses his melee button. 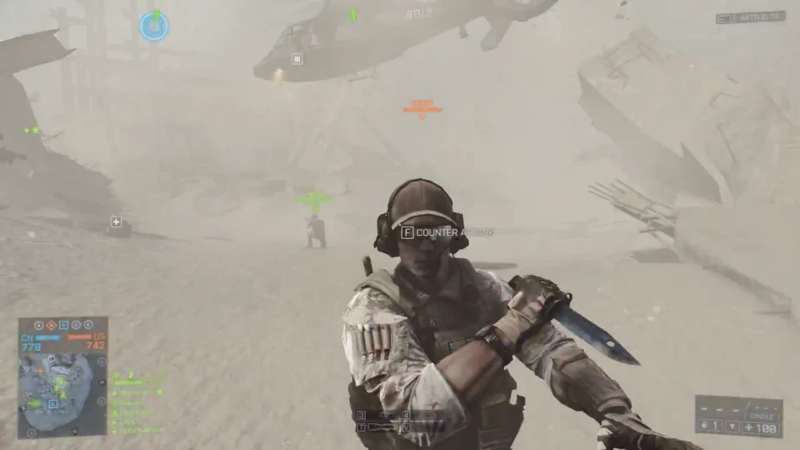 If the player attacked while he was at the side or behind the enemy (Fig-1), he sticks his knife into the enemy and he gets the kill. If the player attacked while the enemy was facing him and the enemy was standing up, the enemy gets a change to defend himself. On his screen a notification pop-ups telling him he needs to press his melee button (Fig-2). If the enemy is able to do so in a certain amount of time, I think it is half a second, he successfully counters the players knife and sticks it in him, killing the player that started the attack. After either the player or the enemy gets the kill, the animation continues for a small amount of time. Only once it is completed is the player/enemy able to move again. I'm not exactly sure on this point, but sometimes it is possible to receive damage while in the knife animation. I believe the victim can't take damage once the animation started (so the kill doesn't get stolen by a teammate of the attacker), but the attacker can. This means that it is possible for teammates of the victim to kill the attacker, saving their teammate. But I'm unaware how this works with counter-knifing though and my experiences in game have given me inconsistent results. Since the release the knifing mechanic has been buggy. Sometimes the animation freezes, one of the players gets teleported to a different side, or the counter-knife-prompt does or does not pop-up while it shouldn't or should. Since DICE (LA) has stopped actively working on the game, these bugs are likely to always stay in the game. Not the answer you're looking for? Browse other questions tagged battlefield-4 or ask your own question. Is there way to disable singleplayer campaign score? What does the commander mean when he says there is a new HVT? How to capture a screenshot without my own character in the picture? How to get the BF3 style “Upcoming Unlock” in BF4? Are there any known workarounds for the January 2014 “sound-loop” crash? What is the single highest rate of fire weapon in bf4? Battlefield 4 is unbelievably laggy, is there any way I can fix it?